This document provides step by step instructions on how to setup Microsoft's OneDrive on a Windows Operating System. Click on the blue plus sign (‘+’) located next to University of Wisconsin Oshkosh on the left side of the window. Enter the name of your office, department, or group/team in the Site name area. Enter the purpose for creating the group or team in the Site description area. Select Private in the Privacy settings area to restrict access to the files. Enter the email address(es) of additional owners in the Add additional owners area. NOTE: It is recommended to have more than one owner, anyone who creates a team will also be an owner. 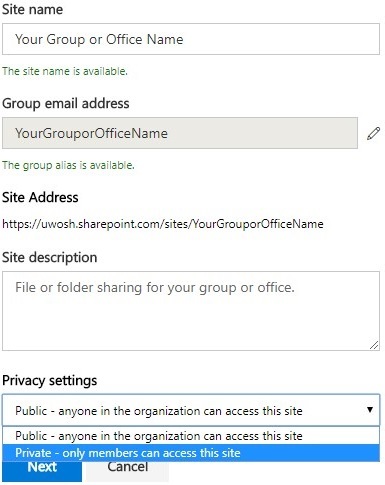 Enter the email address(es) of group/team members in the Add members area to whom you wish to share files. 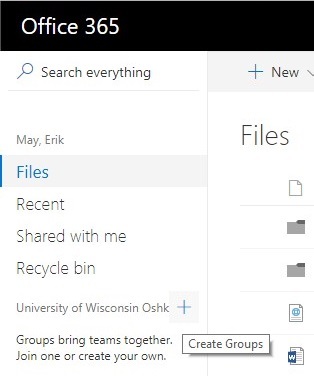 Click on the back button on the web browser to return to the Microsoft OneDrive webpage. 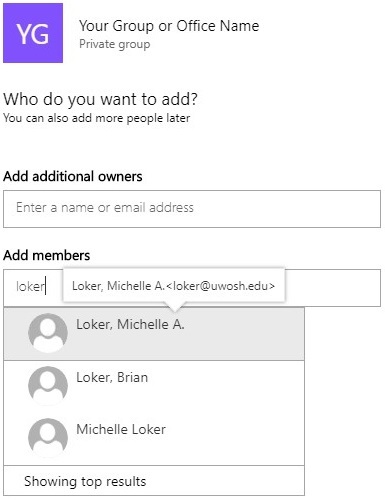 Additional information about Microsoft OneDrive Groups.